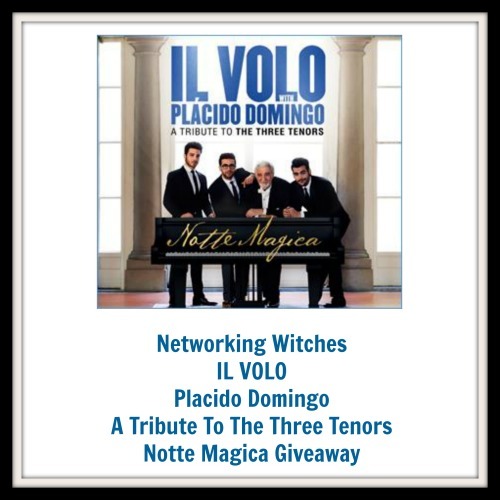 IL VOLO announces the release of their new album Notte Magica – A Tribute to The Three Tenors with special guest, the legendary Plácido Domingo. The new album will give fans around the world the chance to re-live and experience this once-in-a-lifetime event. Maestro Domingo conducted the orchestra of the famous Teatro Massimo di Palermo in eight pieces that evening, and he also joined Il Volo to sing “Non ti scordar di me.” Maestro Marcello Rota alternated with Maestro Domingo as the conductor. The members of Il Volo – Piero Barone, Ignazio Boschetto and Gianluca Ginoble – performed songs that encompassed popular Neapolitan, Italian, and international music, blending in complete harmony with songs from famous musicals and renowned classical opera arias. On July 7, 1990, José Carreras, Plácido Domingo and Luciano Pavarotti sang together for the very first time in one of the most evocative temples of opera, the ancient Baths of Caracalla in Rome – giving life to the biggest classical music project of the century: The Three Tenors. Twenty-six years after this début appearance by The Three Tenors, and fresh from a triumphant worldwide tour, IL VOLO paid tribute to this event and the three Maestri. They delivered the same experience and emotions as the original performance to a new, younger audience, and with the full support and attendance of Pavarotti’s widow Nicoletta Mantovani and the Luciano Pavarotti Foundation. Since forming in 2009, the success of IL VOLO’s critically acclaimed PBS-TV Specials resulted in touring with legendary songstress Barbra Streisand and performing across the world’s greatest stages. To date, the vocal trio have released four albums, charted on the top 10 of Billboard’s Top 200, won two Billboard Latin Music Awards (2014 – “Latin Pop Albums Artist of the Year, Duo or Group”, “El Pulso Social”) and received four nominations, plus two Latin GRAMMY® nominations (2011 – “Best New Artist”, “Best Pop Album by a Duo or Group”). IL VOLO have appeared on major television programs including The Tonight Show, The Today Show, Good Morning America, The Talk, American Idol, The Ellen DeGeneres Show, The Rachael Ray Show The Daytime Emmy Awards, as well as appearing in the final episode of HBO’s smash hit series Entourage. Previous post: Dr. Fedorenko True Organic Skin Care Giveaway! Next post: Sometimes a Girl Just Needs Pearls! In January 2016, the trio began its world tour of the US, Europe and Latin America, which reserved some of the globe’s most prestigious stages for the boys.